About a month of using a Mac has finally convinced me of one thing: the iMac is Good. It has impressed me through and through, right from the display quality and build down to the aesthetics. And if you’re wondering if Apple has managed to convert yet another PC user, the answer is a strong no. There are just too many nuances about using OSX that I could not bear with. 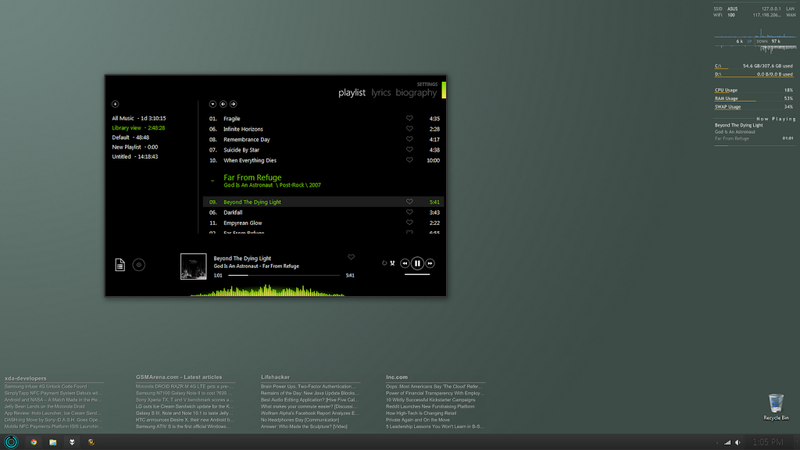 Anyhow, we have another desktop, this time a minimal Win7 setup, along with my recent favorite skin for foobar2000, Metro. The setup is simple, featuring Rainmeter as usual, but also having some additional tricks. Get and run Universal Theme Patcher if you don’t have it already! Feel free to reach me if you run across any issues while setting things up! This entry was posted in Mods and tagged artwork, customization, desktop, laptop, mod, rainmeter, tech. Bookmark the permalink. Follow any comments here with the RSS feed for this post. Post a comment or leave a trackback: Trackback URL. « So how is Jelly Bean?